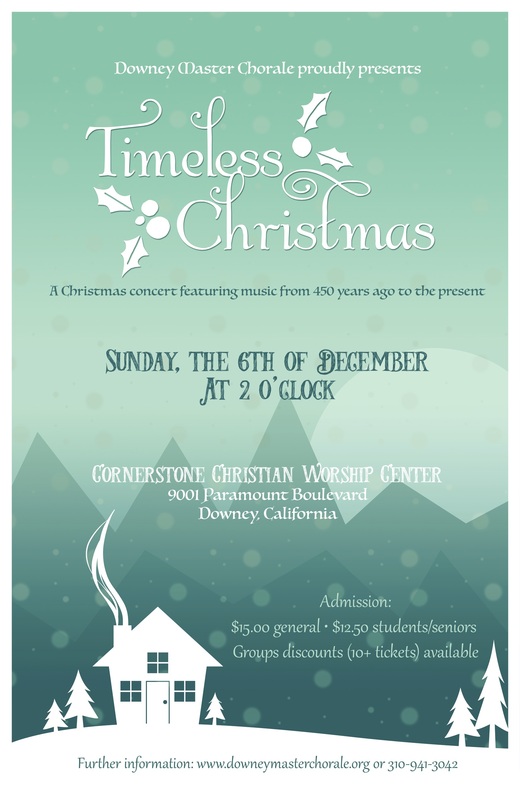 The Downey Master Chorale proudly presents it’s 3rd annual Christmas Concert, “Timeless Christmas,” on Sunday December 6th at 2PM. Hosted by the Cornerstone Christian Worship Center, located at 9001 Paramount Blvd in Downey, next to the 5 freeway. Spanning 450 years of music, the group has planned something for everybody in its Advent/Christmas afternoon presentation. Cornerstone has generously provided a home for the all-city chorus to rehearse and perform this season. They will also provide childcare for concert-goers, kids can enjoy fun activities during the first half of the concert, then join their families for the second half. Admission is $15 or $12.50 for students and seniors. Reception to follow, stay afterward to meet the singers and music director Margaret Zeleny. or call (310) 941-3042 or (562) 927-1436. For singers interested in joining the group, auditions and interviews are ongoing.